A magnetometer measures anomalies in the earth’s natural magnetic field. The anomalies can be due to deposits or objects with magnetic properties in the ground’s upper layer. The magnetic properties are increased by the effect of burning and therefore the magnetometer can reveal accumulations of burnt stones or slag in an iron smelting furnace. Under the right conditions the “cuts” dug down by the people of the past for posts, graves or ditches can be seen. 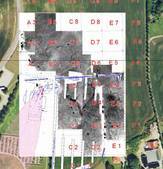 With the help of this method in 2006 and 2007 traces of large stones were identified in the area north of the North Mound at Jelling. Archaeological excavations undertaken by Vejle Museum confirmed that there were large buried standing stones, but also revealed traces of buildings and a huge palisade. In 2008 the magnetometer work focused on the area immediately north and north-east of the monuments, which had not yet been surveyed, in order to locate further traces of settlement. Clear concentrations of especially magnetic ground may indicate particular areas of activity and will be investigated more closely in the coming years. Project participant: Tatyana Smekalova, Moesgård Museum. Result of magnetometer survey at Jelling in 2007 and 2008. Photo: Tatyana Smekalova.